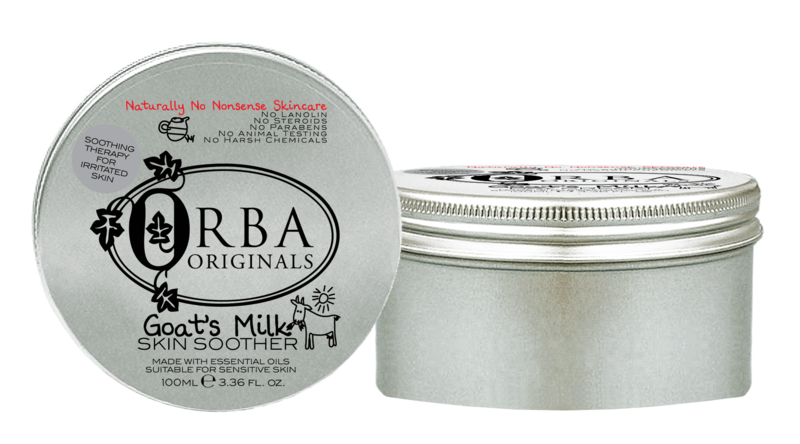 Skin Soother - £13.99 : Orba Originals - Naturally No Nonsense Skincare! Deeply hydrating calming therapy for sensitized and irritable skins. A deeply soothing skin conditioning treatment for irritable skins harnessing the naturally moisturising and anti-inflammatory properties of Goat's Milk. Specially formulated with a powerful essential oil complex including Rose and Rose-scented Geranium, this healing therapy provides targetted cellular hydration and soothing relief for dermatitis, acne and other problem conditions. Gently enriched with Vitamins A, B6, B12 and Vitamin E to boost the complexion and aid regeneration Orba Originals' Skin Soother delivers vital PH balancing care in a luxuriously light lotion. Effectively designed to calm, nourish and protect sensitized skins in need of natural healing care. Daily use helps to rebalance skin's natural PH levels. Apply to clean skin. Use liberally from top to toe as often as required with flare ups. When improved use a smaller amount once or twice daily to maintain calmed and soothed skin. Safe for use on broken skin all over the body and face. Light enough for daily use under make up. Aqua, Cetyl Alcohol, Allantoin, Isopropyl Myristate, Stearic Acid, Cetyl Palmitate, Coconut Acid, Cetearyl Alcohol, Glyceryl Stearate, Potassium Stearate, Potassium Cocoate, Sodium Stearate, Sodium Cocoate, Phenoxyethanol, Ethylhexylglycerin, Caprae Lac, Rosa Centifolia Flower Extract, Pelargonium Graveolens Oil, Citral, Citronellol, Geraniol, Linalool. .